I find myself at the end of most semesters brainstorming on how I might ease my teaching burden. I teach about eight different upper-level courses on early modern Europe in rotation, on subjects, periods and places ranging from the Renaissance through Napoleon (in addition to Western Civ). Almost every course usually covers 100 years or more, as well as several different European countries. Heck, my Religion, War and Peace course even takes it back to the Old Testament. Since I only teach each course perhaps once every two or three years, I often only vaguely remember the details of many events. Memory really does benefit from repetition, it appears. So as I reflect on the semester just ending, I wonder for the umpteenth time how I can make it easier to remember a myriad of historical details. I hate the fact that I’ll forget many of the details I covered this semester, and will have to relearn them when I teach the same course again in a couple of years – even rereading my notes requires a lot of time I’d prefer to save for other things. 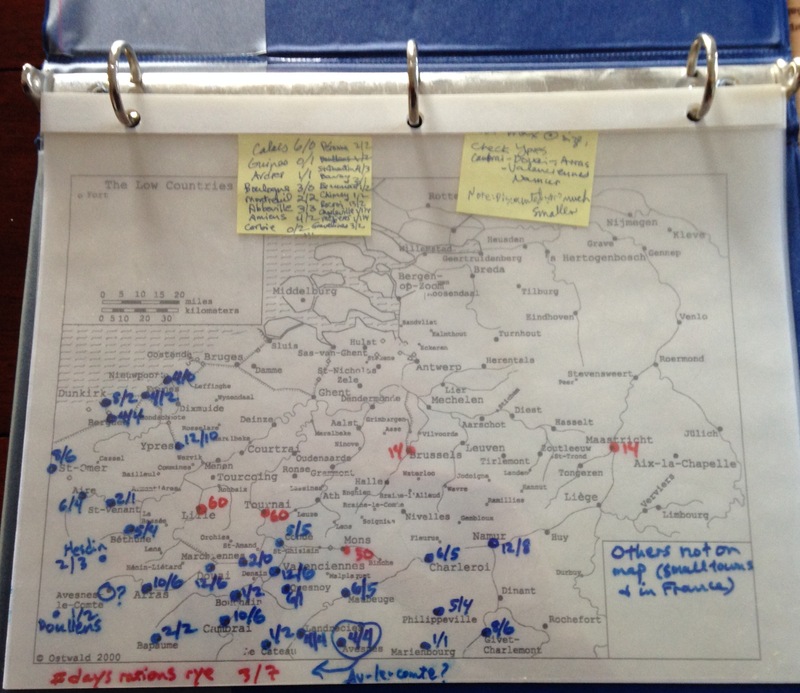 I want, in short, to efficiently prep for class by reviewing a visualization of my notes on the campaign or war or theater or commander or historical event under discussion, and then narrate off of it in class (and provide the visual to students for their own notes). Is that asking too much? 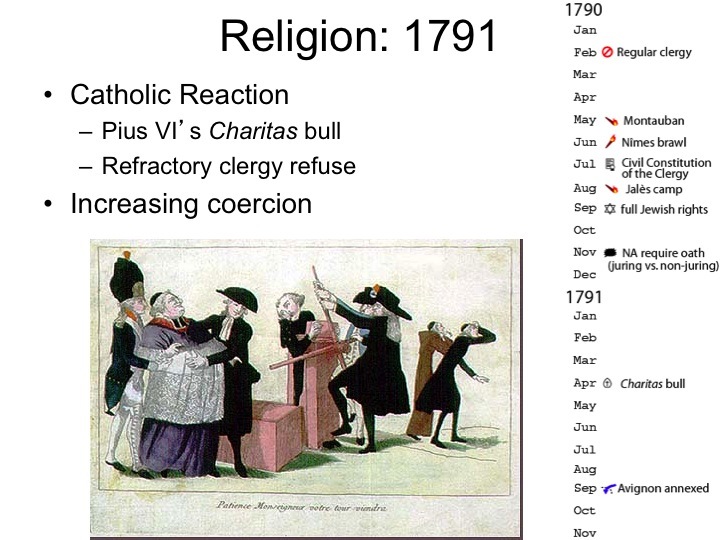 As faithful skulkers know, I’ve developed a collection of time charts covering the early modern period. Assessing this semester’s European Warfare course, spanning almost 500 years of military history, however, has reinforced more than ever that the geographical variable needs greater emphasis, not only for student comprehension, but as a way to improve my own retention. My time charts provide chronological structure, but it’s not always easy to see spatial distribution on them. The interaction of the two is key, especially in military history, but also in courses covering interactions (political, diplomatic, economic, cultural…) between various countries, or regions within individual countries – my FrenchRev/Nap and Tudor/Stuart courses come to mind. Sure, my Powerpoint presentations include plenty of maps drawn liberally from books and atlases – military historians certainly have a plethora of maps to choose from. But too often secondary sources either include only generic base maps (rarely even including the terrain), or decontextualized locations of various battles and sieges over the length of one or more wars. You know the kinds of maps I’m talking about. Even if you detect a geographical pattern in the distribution of sieges or battles, what can you do with that info? It’s never been clear to me. I also have little trouble finding tactical maps of big battles. But really, I want the bigger picture, since battles rarely tell the whole story, or even the biggest part of it. 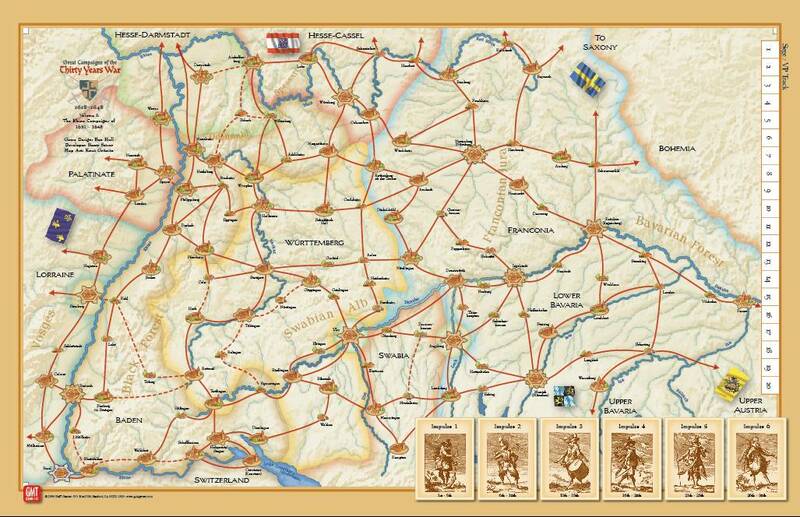 If you study the French Revolutionary and Napoleonic wars you can find operational maps for just about every campaign. 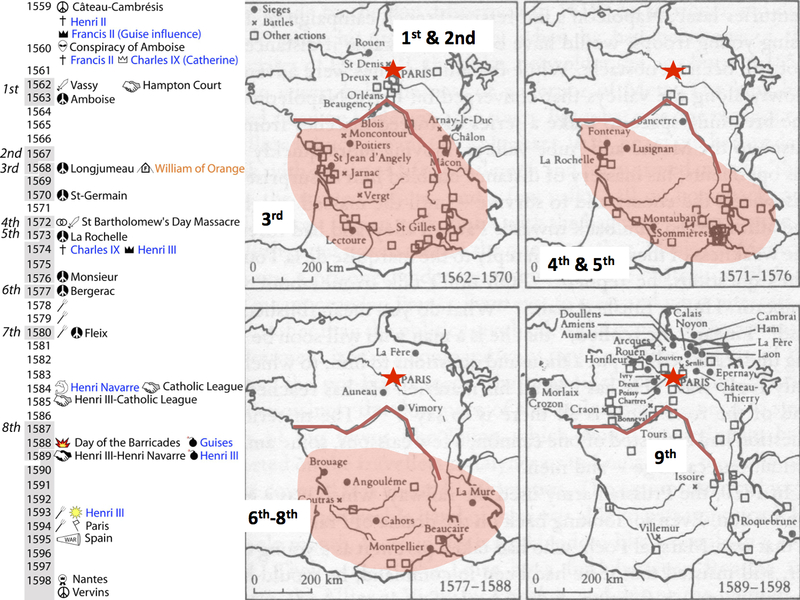 But when looking for maps of specific early modern campaigns, where campaigns have too often been deemed “random” and “indecisive”, when earlier historians questioned whether their commanders even bothered to conduct a “strategy”, it’s a bit more difficult. So let’s take a tour of what I’ve come across, and you can add your own suggestions in the comments. It looks nice, but it’s also confusing, particularly when it explicitly claims to be about the 1644 campaign, yet oddly includes information about a dozen other campaigns (sieges, battles, armistices) twenty years prior to 1644. Nor does it bother to explain the different line styles. Maybe we should just stick with the war gamers’ artistry? Another option is to consider the design a bit more explicitly. 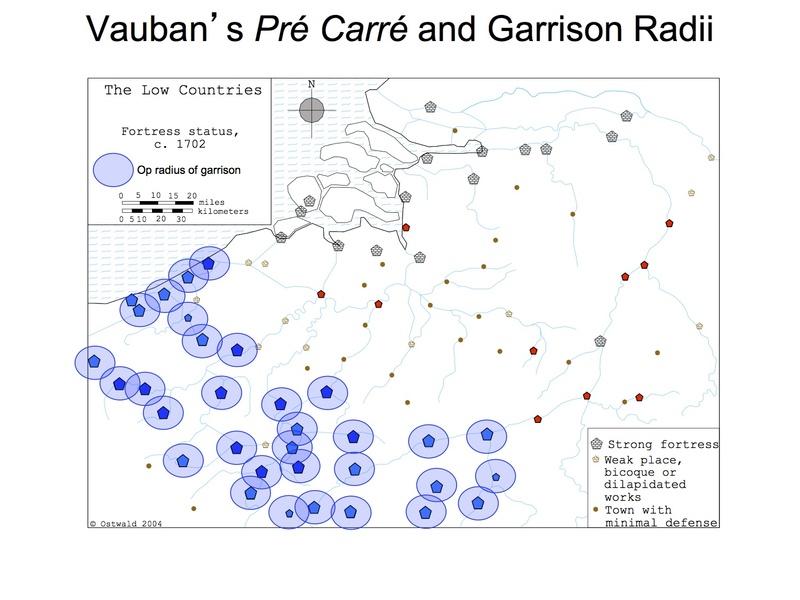 One of the more thoughtful operational map designs that I know of is Derek Croxton’s “integrated” operational map of this same 1644 French campaign in Germany – check out his “A Territorial Imperative?” article, esp. 265-266 for discussion. As Derek points out, a good operational map will help explain why an army suddenly shifted direction, why a campaign theater encouraged armies to follow certain routes. The map is making an intentional argument as much as providing geographical reference points. Derek’s maps place the movements of armies within the broader constraints of the Bavarian theater: rivers, forests, hills, fortresses. Depending on how detailed you wanted to get, you could also consider indicating weather/travel conditions, the logistical capacity of the area, e.g. which areas had already been exhausted by campaigning, and so on. Perhaps you might even indicate those little territories that remained neutral, requiring an army to march around them, or wait until they negotiated passage? And, since I’m already making requests, how about using line style to indicate the frequency of camps, e.g. dots or dashes representing when the enemy encamped, which would allow you to easily see forced marches, the frequency of halts, etc.? For example: —..———-…—–.–.—-. More data to collect, but more information portrayed. It’s true the addition of such data to a map (assuming you have it) would make the map look more busy, and possibly distract the eye. You probably wouldn’t want to include all the above-mentioned info on a single map. But a lot of the problems can be mitigated by smart design, starting with a consistent and meaningful symbolism across maps, and segregating information into separate layers if we’re talking digital maps (or acetate overlays in ye olden dayes). Small multiples are always an option as well. Regardless of which details we include, we should be making better military maps. Oversimplifying an operational map misses the whole point. If the point of the map is to make sense of an army’s peregrinations, to put the map reader in the riding boots of the commander, it helps to remind the viewer that the army was operating in an actual theater, with actual terrain, and actual physical features that dictated where they could and couldn’t go. Unlike contemporaries, we don’t necessarily know the theater’s less-tangible constraints and nuances either. Why bother protecting (or threatening) one town over another? 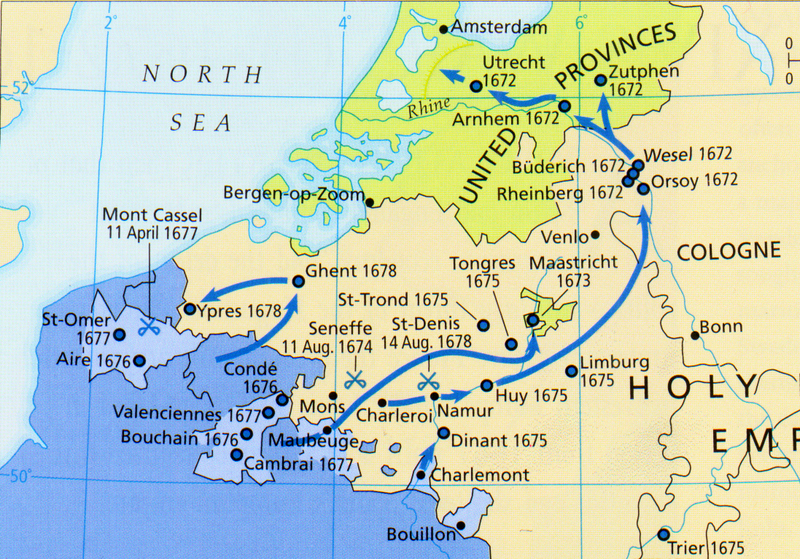 Our historical operational analysis might improve, for example, if we know that Douai was the main French arsenal in northern France, Tournai was the center of the Parlement de Flandres, and Lille was an important financial center for French bills of exchange. Since we won’t ‘see’ a map of the theater in the same way contemporaries saw it, the historian has to help fill in those gaps. A village is not a garrison town is not a regional commercial hub – but if they’re indicated with the same size dot, who can tell? Adding such features wouldn’t be that difficult: we can probably all think of thematic maps from historical atlases that indicate which towns were the heads of dioceses or archbishoprics, or which towns were commercial vs. administrative centers. All it needs is an intelligent use of point symbols to unobtrusively add more information to all those dots on a map. That’s data density. And such maps also help replace text as much as supplement it. Practically-speaking, if I can get the gist from spending five minutes looking at a map rather than reading 20 pages of detailed narrative of a campaign and try to follow those maneuvers in my own mental map, I’ll take the externalized version. But enough about the operational level. More rare are maps that seek to provide a perspective above the operational level, or at least generalize operations into main axes of advance. I often need a middle ground between maps showing detailed march routes (operational level) and those showing who fought on which side (grand strategic level). Maps that show, for example, the thrusts of the main offensives, and ideally, their results. 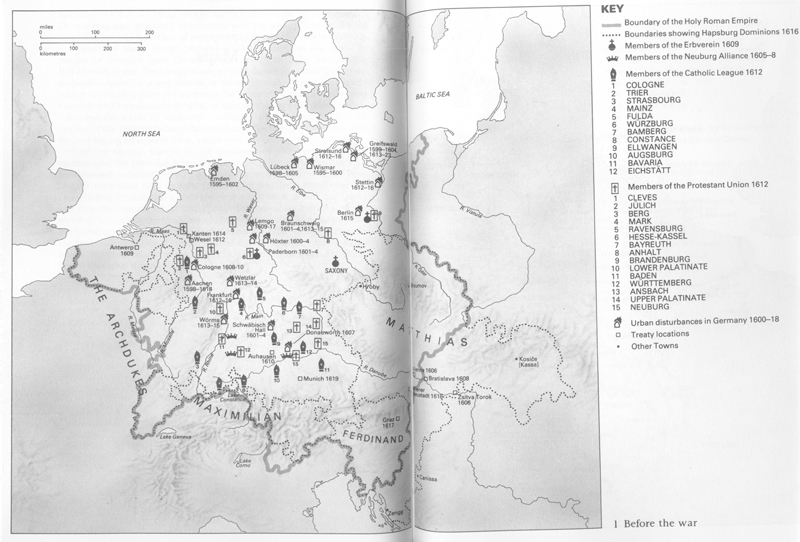 A number of such strategic-level maps do exist. Of late the most accessible operational maps of early modern campaigns illustrate the paths of multiple armies marching over the same terrain for several years, even an entire war. Helpful, but a bit confusing if there’s neither rhyme nor reason to the symbolism used. Better would be a more intuitive way to show chronological progression – my eye never quite knows where to start when multiple campaigns are superimposed on a single map, and where to look next. Which are concurrent and which are in response to the others? The arrow colors indicate specific commanders: should the main variable for these operations be the commanders, or should it be the chronology? Is it a good idea to use colored arrows when the colors of the areas behind them interfere with their hues? Me so confused. This CIAW map does a decent job of illustrating the 1672 Rampjaar and the gradual incorporation of parts of Spanish Flanders into France, though there’s too much text (esp. the dates) and not enough symbols for my taste. And it would have been nice to distinguish Spanish territory from Liègeois, to make more sense of the French 1672 march route. I’ve never been a fan of the style of the West Point maps, but then I wasn’t brought up on military maps, just boardgames and computer games. Some of the front lines are incorrect on this map, which prompted me to create my own version. 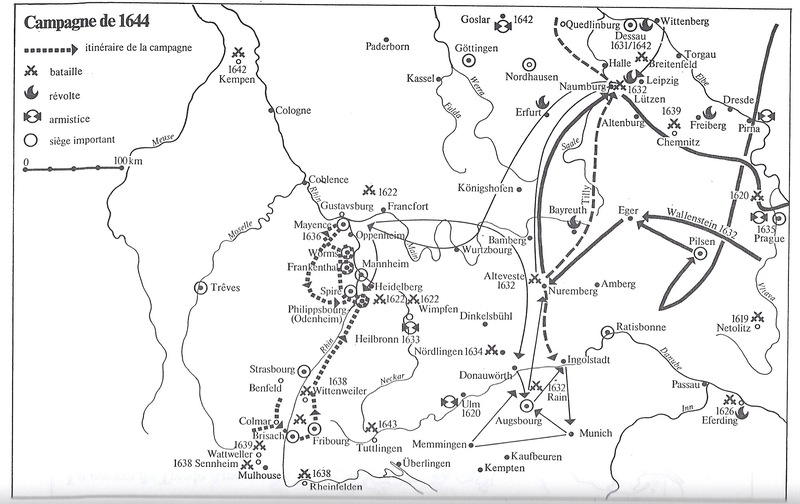 Nevertheless, it does give an ok overview, including the fortified lines, but since it insists on including the Bavarian campaign you can’t really focus on specific operations because the scale is too small. The pull of the decisive battle even distorts maps. Use an inset if you want to include the 1704 march. This map does a pretty good job of making use of point, line and area symbols, though I’d prefer more variation with the fonts. 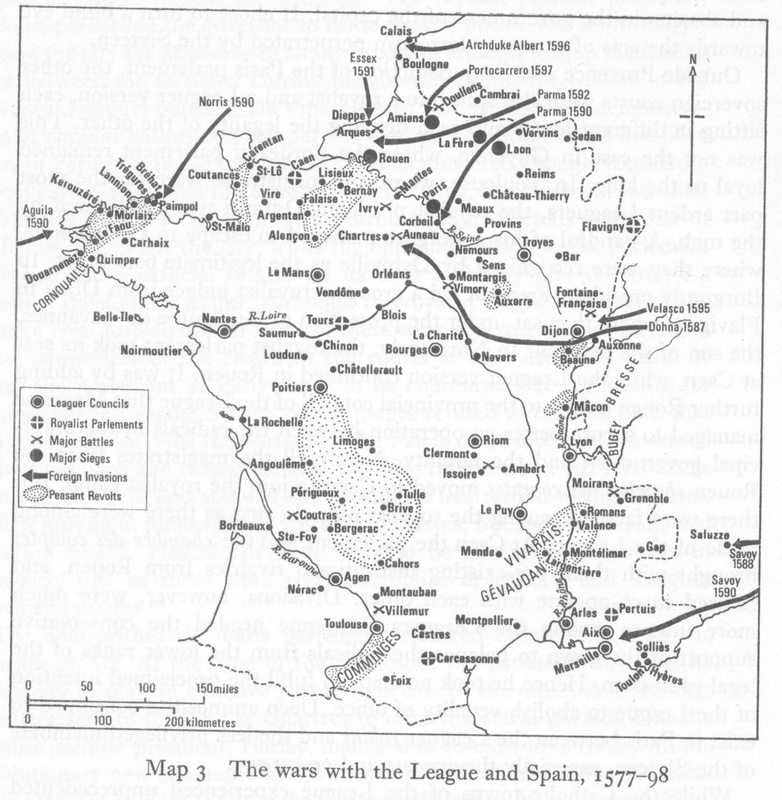 I particularly like the lines illustrating the foreign intervention into France’s civil war. 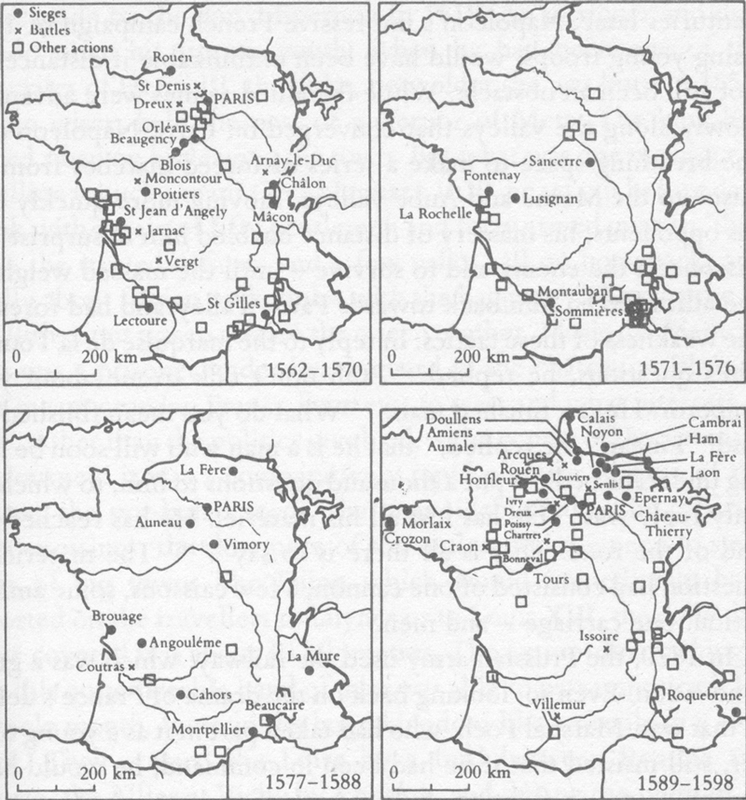 French Wars of Religion small multiples (Braudel, Identity of France, 111). Rarest of all are thematic maps. 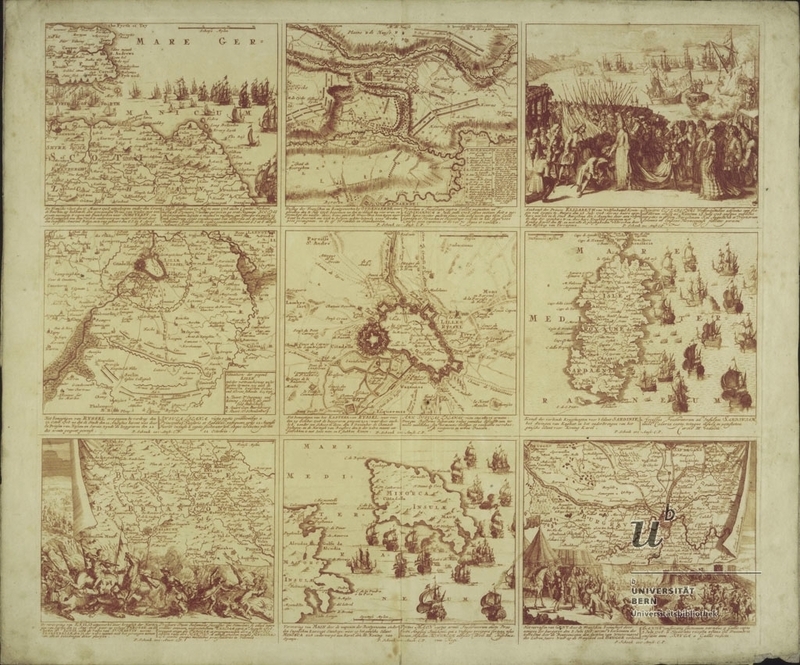 These seem to be a specialty of French historians (and historians of France influenced by them) – the Annales tradition (and before that, the 19C tradition of which Minard was a disciple) probably helps explain the inventive ways Frenchified historians have used maps. 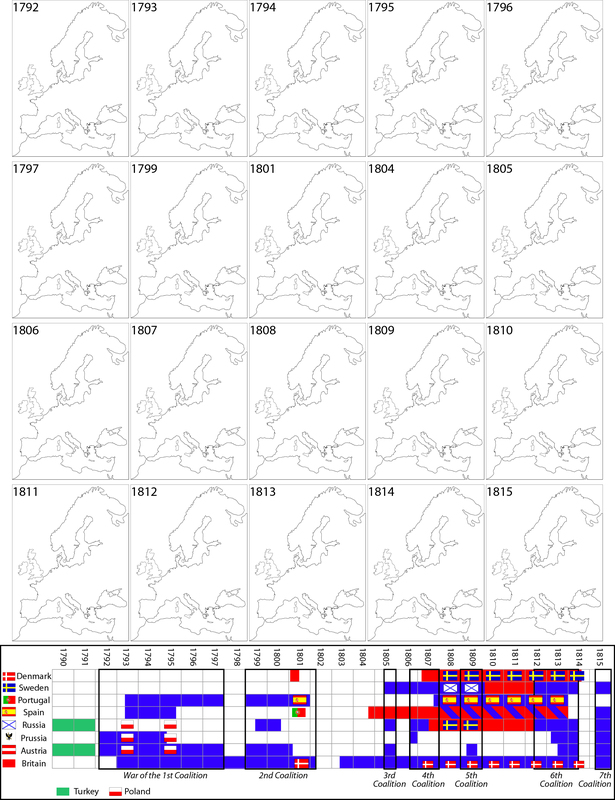 The choropleth map is a standard in French history works, befitting the French statistical tradition. 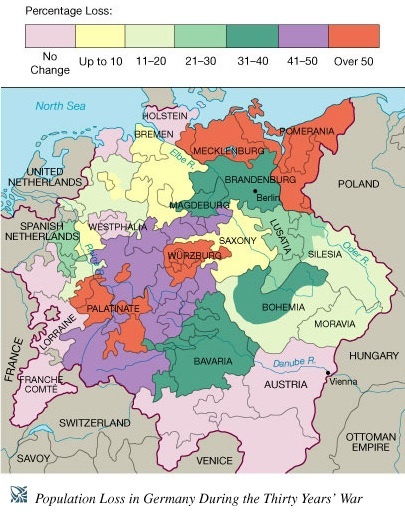 That being said, the most common early modern military permutation is actually the ubiquitous map illustrating population losses in Germany from the 30YW. Population loss from 30YW. Note the counter-intuitive color scale: for color help, see ColorBrewer. I probably like the next map most of all, because it tells an actual story on the level most of my coursework operates on. 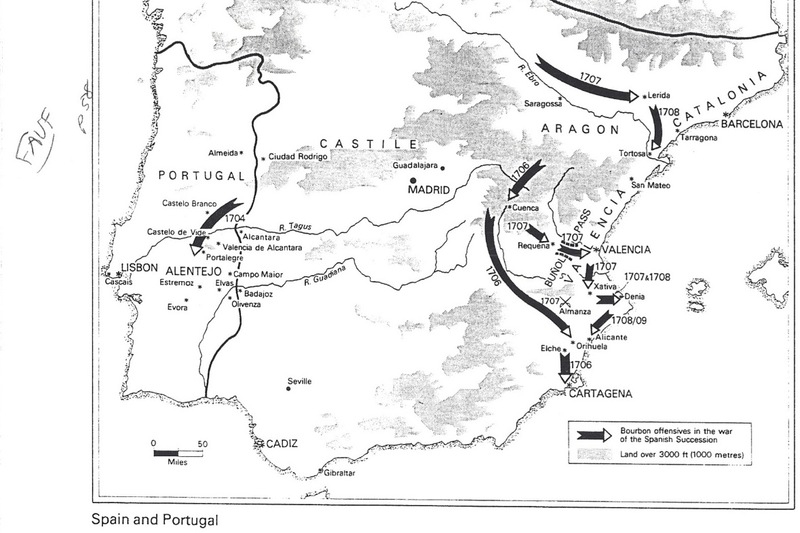 As should be obvious, this tells the story of how France, over the course of the 17C, managed to break the Spanish encirclement on its northern, eastern and southern borders. It also illustrates how Spain had to deal simultaneously with multiple challenges to its rule (revolts being part of the “General Crisis of the 17C”). No surprise that it’s found in a book entitled Europe and the Decline of Spain. 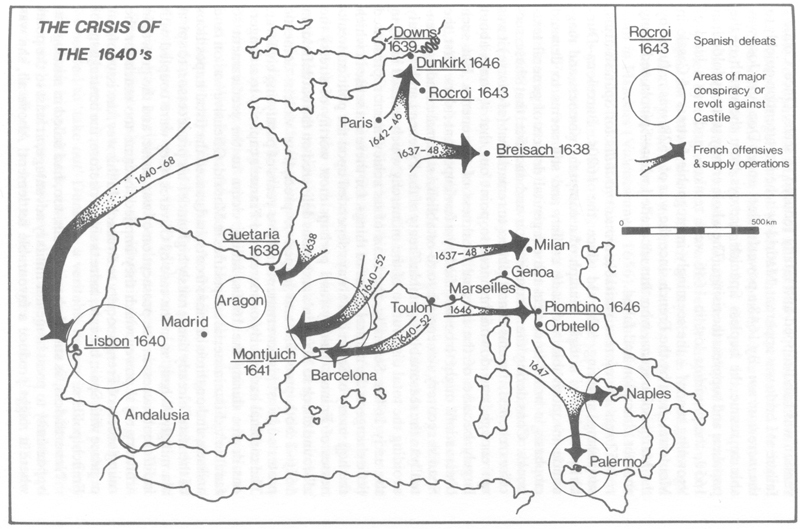 My main recommendation for improvement would be to use shading to indicate the Spanish territories surrounding France; as it is, the arrows emanating from France suggest that it is the visual focus, with no indication of where Spain’s non-Iberian territories were located. So there are indeed good maps, and good model maps, out there. 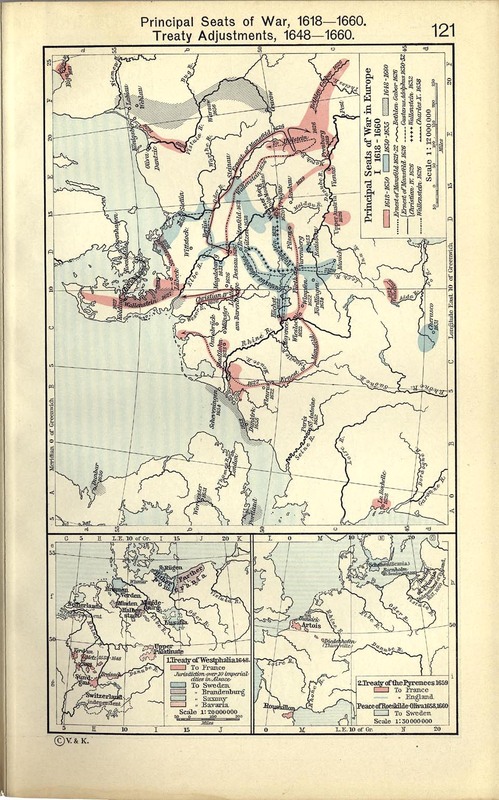 But they are few in number, very limited regarding which wars/theaters/operations are covered, and often include only one or two pieces of information (as we discussed with Minard’s map previously). Most of the good ones, those with any detail at least, also appear in more specialized histories that are often difficult to locate. That leaves it up to us to fill in the gaps the best we can. 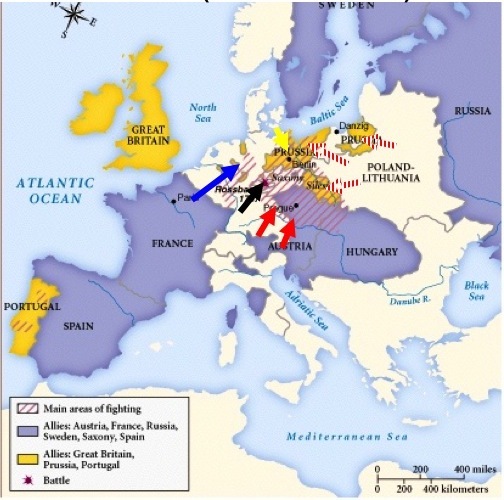 This underlying map (I think from Lynn Hunt’s Western Civ textbook) does an unusually good job of combining two strategic elements: the coalitions engaged and the main operational areas – always worth reminding students that belligerent countries didn’t necessarily see fighting in their own lands. I just added some strategic-level arrows to illustrate how Frederick was surrounded and needed to march along interior lines to beat back one foe after another. Good for a few minutes of discussion. Yet there are problems. Most wars don’t have such a map already created, it’s hard to find boundary-appropriate maps for some periods, and the use of such maps is limited by copyright if you’re thinking publication. Depending on your purpose, it’s also unfortunate that such maps conflate years of conflict into a single snapshot. 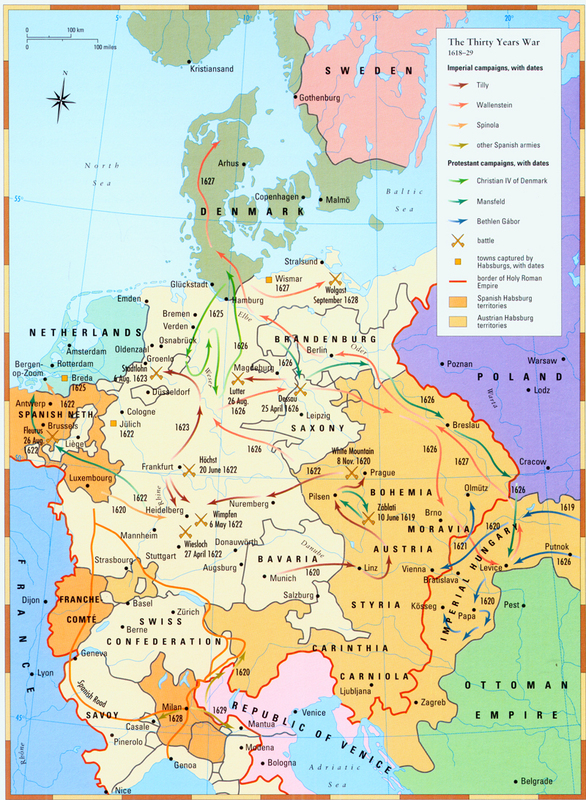 The chronological progression may very well be important – did all of Frederick’s enemies attack him at exactly the same time, or was their lack of coordinated operations important? For that matter, did he even have all those enemies throughout the entire war, or did they enter and leave the anti-Prussian alliance piecemeal? To illustrate that, you need to include multiple maps, one for each phase. More often than not, this means creating your own. This is map-making at its most time consuming: creating a map for each year (which assumes that you have a good base map with appropriate boundaries), and then combining them together somehow, without ending up with a plate of spaghetti. The two most obvious solutions are to either use small multiples or animation. I’ve shown my rudimentary attempts at animation already, but increasingly I’m leaning towards small multiples – the ability to directly compare details by moving your eyes to the left/right and up/down seems more efficient than relying on visual memory as an animation plays. 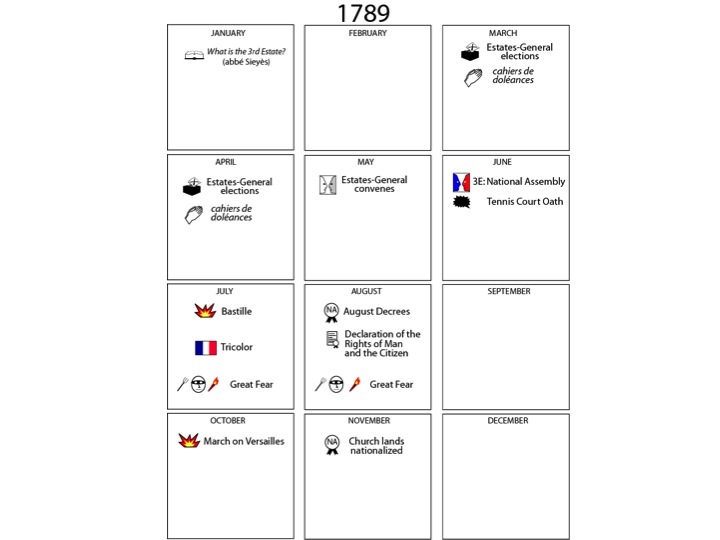 The above summary of the 1708 operations recognizes the simultaneity of events occurring in different theaters at the same (approximate) time. 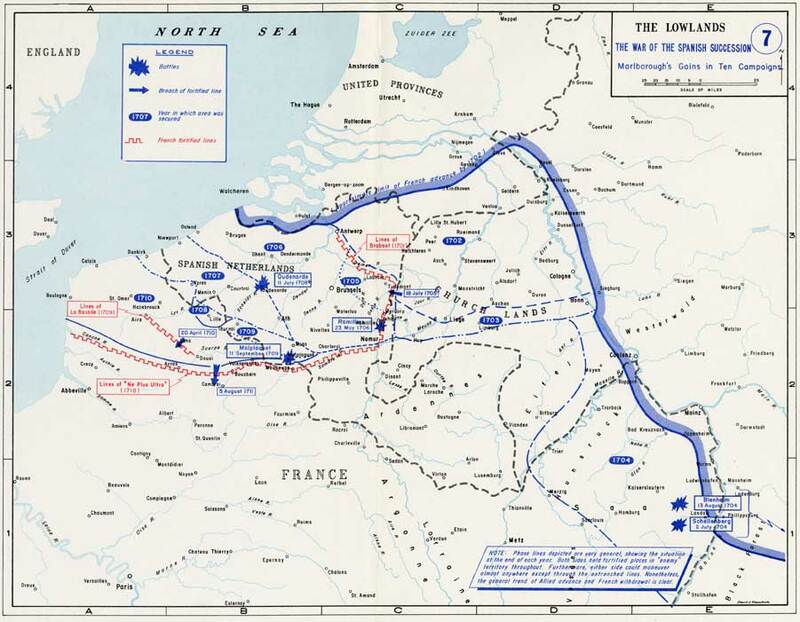 It also recognized the need for the equivalent of an inset/detail – witness the operational and tactical views of the siege of Lille (second row). 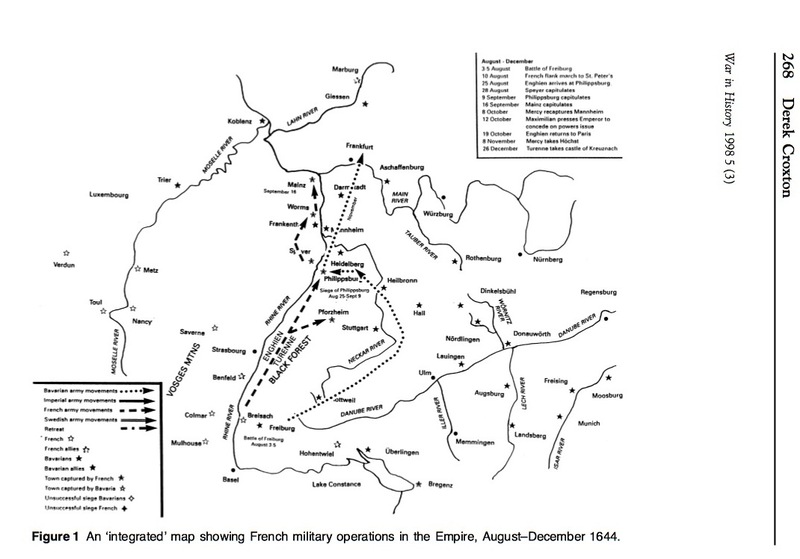 Though such maps allow one to directly compare operations in different theaters (and you could even draw arrows indicating reinforcements from one theater to another), it doesn’t appreciate the analytical utility of small multiples when comparing things at exactly the same scale. It might be informative to display the four theater to scale, so that the viewer could see how much larger the Iberian theater was than Flanders. Maybe even indicate distances marched for the campaign in each theater. I’d probably want to add a timeline along the margin of each quadrant as well. Ideally you’d tweak this by adding borders, and probably crop the map a bit. But something like this could be quite useful for note taking, and then be cleaned up for presentation. 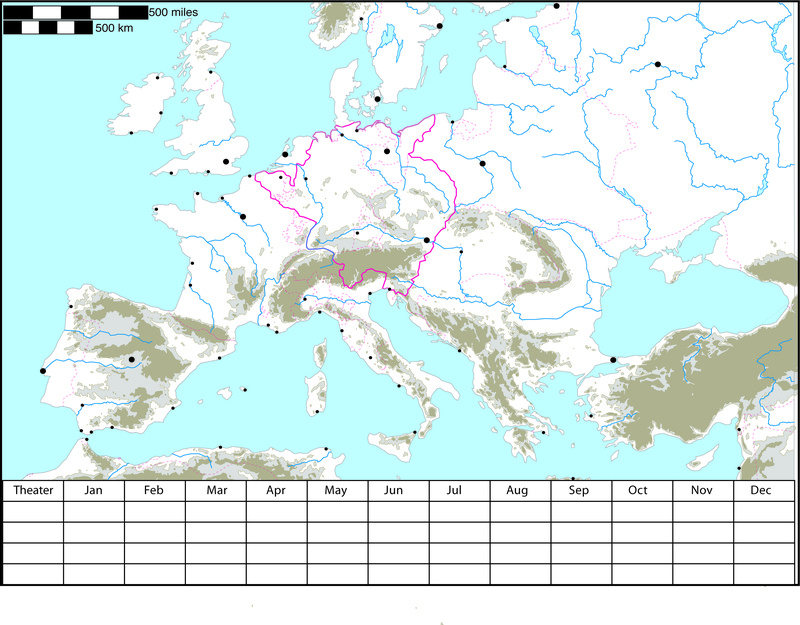 This template allows me to make spatial notations while at the same time keeping track of the chronology. You can even coordinate the two by using the same symbols on the map and in the time chart. All sorts of possibilities. Now if I only had the time.